The Pearl Place has 34 residential floors on top of a multi- level podium. This 2-tower development from Robinsons Communities is located in the heart of Ortigas Central Business District, it promises to be an investment that you would truly treasure. Even with such an advantageous location, The Pearl Place has a quiet, suburban vibe ideal for students, young professionals, and start-up families, making it a welcome haven amidst the hustle and bustle of city living. 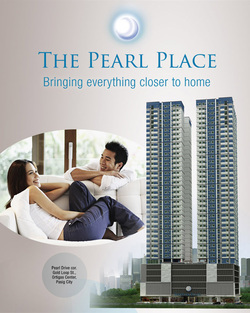 The Pearl place shines as your best investment as it is being offered at the most competitive rates with the area. Units will be handed ove r as bare spaces for owners to customize and create their own personal abode according to their hearts desires. A joint venture between Robinsons Land Corporation and Federal Land, Inc. - two of the country's most stable and respectable real state companies with an impeccable track record and a reputation for integrity, the Axis Residences is definitely another testament to the two companies' legacy of excellence. It is nestled right in the middle of the capital's major business districts: the Makati Central Business District, the Ortigas Buisness District and the Bonifacio Global City. Being right at the axis of where everything happens, it is also within proximity to all major commercial areas that house entertainment, shopping, dining and recreational establishments. Being very close to EDSA-the metro's main thoroughfare-it is very accessible via all the major transport systems. With its ideal location to both business and leisure hubs, one can juggle the best of all worlds. Work time can be maximized without sacrificing quality time at home with the family, and even personal, self-fulfilling pursuits. At the Axis Residences, you will reap the rewards of living at the center. While the world rotates around you-you can live, work and grow. Acacia Escalades is all that and more, making it an ideal residence you would naturally want to come home to. Robinsons Communities consider this "Green Condominium" as one of its most inspired property developments. This Filipiniana-themed project is uniquely designed so that building are energy efficient, with a single loaded corridors having a central courtyard, giving you a free flow of light and air. With Robinsons Land Corporation's solid experience in creating new neighborhoods, Acacia Escalades will provide you and your family a safe and vibrant commmunity. Choose between Studio, 1BR and 2BR units, deliver bare with finished toilet & bath. Only a 10-minute drive from Makati and NAIA, find your retreat in a perfect home where you can breathe the fresh air afforded by 70% wide open space and relax in any of the 7-themed landscape gardens. Units are ready for Occupancy. Welcome to cosmopolitan living! Rises at the heart of Mandaluyong City, Gateway Garden Ridge promises to be the smart and practical choice for young urban families and active individuals.